Give your office the ergonomic upgrades it needs to keep you and your colleagues working better. This is the Raynor Ergohuman Chair - Custom Fabric Chair with Headrest CU9ERG, and it's supremely customizable to your needs, giving you a stylish chair that can help you improve your comfort levels at work with a single seat switch up. Also known as the "ergo human chair", it provides constant back and lumbar support with built-in flexzones, letting you get to that sitting sweet spot easily. The Ergohuman chair comes with adjustable, pivoting arms, and an adjustable headrest, giving you even more flexibility to alter your seating situation. Add in synchro-tilt, tilt-tension control mechanisms, and adjustable seat depth and pneumatic height adjustments for an optimally supportive seat. Available in your pick of fabric for a stylish addition the office will appreciate. Returns on chairs in colors other than black may incur a higher restocking fee. Please consider this when placing your chair order. The Raynor Ergohuman Chair is available in four standard colors in Euro fabric: black, charcoal, navy, or burgundy. Great lumbar support, arm rests are an issue. This chair is the most comfortable I have ever sat in. That being said, there is only 1 thing holding it back from a 5 star rating in my opinion. The arm rests try to do everything at once, and fail. They telescope up and down, slide forward and back, and even tilt in and out. The problem lies in the fact that there are NO locking mechanisms for any of these adjustments. The arms get moved out of position very easily, and cannot be used in any manner other than resting your arms lightly on them. A locking mechanism for all 3 adjustments in the arms would make this chair superior. As it is, 4 of 5 stars. If you are looking for a beautiful, supportive, and comfortable office chair, look no further! 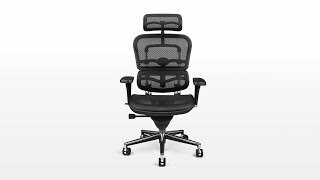 I have NEVER CONSIDERED paying this much for an office chair before, but when I was furnishing my new office with the back/neck aches from my crappy old chair still fresh in my memory, I knew I needed something that could be used all day. I took a chance and ordered the "Mudslide" leather version of this chair, hoping it would compliment my office of dark browns and blacks. I was not disappointed! I needed a chair that wouldn't be an eye-sore or distraction for clients but could also support my back and neck for long hours at the computer. This chair is perfect for both! Very adaptable to all bodies, this chair moves with my body as I shift. It only took minutes to adjust the chair to my height/size which was surprising since I am short (5'3") and the chair is substantial in size. Assembly was not my favorite task, but was as easy as possible considering that the end product was this incredibly sturdy, gorgeous chair. I did it by myself (wrong decision), but I think having two people would have made it a snap. Love it! I really liked the idea of the leather ergohuman because I sit in my chair for 9 hours a day and preferred a padded sea. We're required to order matching color chairs at work so the black leather wouldn't work for me. This was the perfect solution-the only thing that was hard was picking from all those fabric options :) It showed up one week after I ordered online. The chair is really comfortable- and I'm getting the support I expected from all the reviews I found online that lead me to this chair in the first place. $711.00 List Price: $1,452.00* The list price is the same as the MSRP (Manufacturer's Suggested Retail Price). It may not necessarily be the price at which the product is sold.